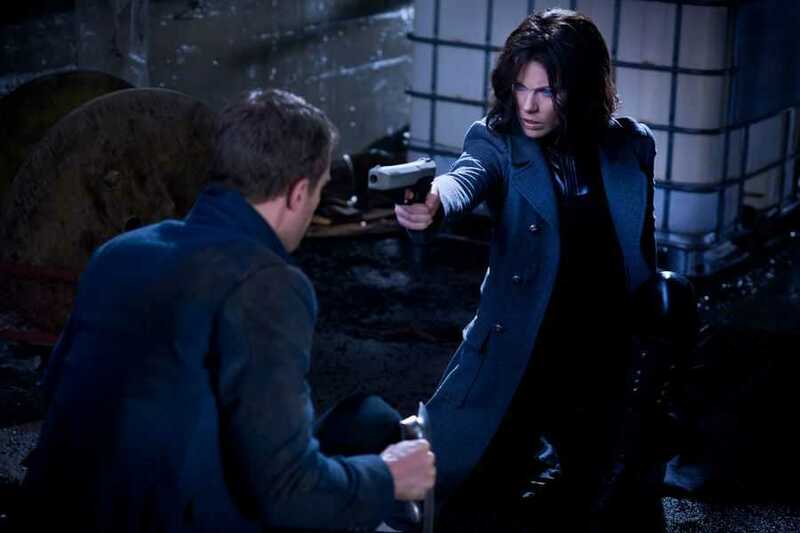 Being a fan of the franchise, I was quite excited when the trailers for Underworld: Awakening (or Underworld 4 if you so prefer) rolled out last year in the fall and I got to see some welcome non-sparkly vampire action yet again. That excitement built up over the last two months as the film’s marketing crew ramped up things on their Facebook page and the promotions for Awakening went into overdrive. So when I finally got to see the film this Friday, my expectations of the film were surpassed extremely nicely and I’m glad to say that I thoroughly enjoyed the latest entry into the franchise. Underworld: Awakening starts off with an extremely brief recap of events from the previous movies and then puts us right back into the action as we learn that Humans have finally become aware of both Vampires and Lycans and subsequently launch a rather successful worldwide Purge to destroy the two species. Which is where Selene and Michael step in, hoping to escape all the mayhem, but, as they say, things don’t always work out as you expect. The next that Selene is back on-screen, you better be staying out of her way as she tries to make sense of a world gone mad is looking for Michael. The film met all my expectations and then went beyond them. First off, the action scenes and the fight sequences in Awakening are the most brutal and bloodiest yet and I would definitely not advise parents to take their younglings to see this movie. This is good, especially we have been treated to a rather tame version of Vampire action over the last couple years. The action also varies quite a bit in location and the number of combatants involved and we definitely get to see the enhanced Selene showing just how different she is from the rest of the Vampires. Rest in peace Alexander Corvinus, your gift was well-received. Kate Beckinsale turns in another great performance as usual. Her third official outing as the Vampire Deathdealer Selene (stock footage from the first film was used in Rise of the Lycans) sees her character as a more mature version than the first two films and she is also much more of a take-charge kind of Selene too. Not as headstrong as before either but her emotions do still drive her. Given that her world has changed completely, what with her being frozen in ice, while her species has been hunted to the brink of extinction, the change in attitude fits right in. One of the most obvious ways in which we see her character mature from the previous outings and throughout Awakening as well is in her dealings with the other Vampires, a Human detective and the unsubtly named young girl, Eve, who is also known as Subject One (Selene is Subject Two). India Eisley as Eve aka Subject One delivers a good performance, which, while not as strong as that of Kate Beckinsale, is not dull either. Her character is quite the reflection of another character from the previous movies who is conspicuously absent in the movie, and she doesn’t have that much screen-time or significant dialogue either. Both these things mean that she is measured against high expectations, perhaps higher than they should be really, and therefore she is not able to meet them. That said, she is still quite decent in her performance and with the way the movie ends, I expect to see her again in a fifth installment of the franchise. It wouldn’t feel right if she is replaced in the possible sequel. Theo James as the Vampire David (the guy in blue in the picture) delivered another decent performance but David has a rather small role in the grand scheme of things and so neither the actor nor the character really gets to shine. That said, for the scenes he is in, he delivers well enough and his action scenes against Lycans are quite good too. He uses an iron chain-whip to fight so that alone takes his character up a few notches on the badass-o-meter. And finally we have Michael Ealy as Detective Sebastian who is tasked with investigating the disappearance of Selene and Eve from a research facility. Ealy’s performance is forgettable. This is not quite accurate to say, but his performance lacks any kind of emotion at all. You just don’t feel any need to connect with his character and that is rather disappointing. A longer movie could have helped his case I think, but, the movie’s length is as it is. And then there are the other small characters like Stephen Rea’s Dr Jacob Lane and Charles Dance’s Thomas, the leader of one of the surviving Vampire covens and David’s father. Both of them are rather lackluster, especially they have both turned out rather great performances previously: Rea as Inspector Finch in V for Vendetta and Dance as Tywin Lannister in HBO’s Game of Thrones. But that’s ok since none of them are really that integral to the plot anyway, Dance more so than Rea. If their performances had been stronger and livelier, then that would have only helped Awakening but it is no deal-breaker, at least not to me. The pacing of the movie is solid. There is never a dull moment because the action is quick with its adrenaline-rush and the dramatic parts are just the right length too and none of the scenes are strung out more than they should be either. My only complaint with Awakening is that it is too short by a good fifteen-twenty minutes, especially when compared with both Underworld and Underworld: Evolution. The movie could definitely, definitely have been longer and it would have delivered a much better experience, although it still got the job done and delivered on its promise of another great supernatural/horror action film. The score of the movie (not the soundtrack) is also very good. It is appropriate in all places and at times, especially towards the end, it is quite a sweeping, epic score too and I quite liked it. The score is to be released on Valentine’s Day from what I’m told and I just might go out and buy it. The 3D aspect of the film is the best part of Awakening. It is a very dominant feature and you can see the 3D scenes as real and proper 3D scenes rather than what appears to be 2D slapped on 3D. Comparing this to Captain America, which was the last 3D film I saw, Awakening is miles ahead of the competition. I was initially regretting that there wasn’t a regular version of the film released here but after seeing the 3D version, I have to admit that I was blown-away. I wasn’t expecting it to be so good. You can actually see the waterfalls falling towards you. You can see David’s chain-whip coming towards you. Selene actually moves forwards and she throws her hand-mine-thingamajigs towards you. All in all, a very good effort at a 3D print. Another thing in Awakening is that you can both feel and see the passion of the directors, the writers and the actors, among others. The story on its own is quite tight and while more would have been good, it still chugs along nicely and there aren’t any loose ends that are detrimental to the finished product. When I watched the film, I was drawn into the story, and I connected with the characters. For me, it was quite easy to see that this is a film that is contextually appropriate to have been made and that it is not there just to cash in on the franchise’s popularity but is also a story that needed to be told, given the right impetus. I’m actually glad that Awakening was made because the ending of Evolution was quite open and while the fourth installment doesn’t go in the direction I was hoping it would, it is nevertheless still an integral part of the franchise. All in all, I recommend Underworld: Awakening quite highly and I encourage everyone to see it, even if you have only seen Underworld. It is a very good movie with strong acting, a strong script, strong atmosphere and a story that should be told. Posted on February 13, 2014, in Movie Reviews, Review Central and tagged Björn Stein, Charles Dance, India Eisley, Kate Beckinsale, Lakeshore Entertainment, Len Wiseman, Måns Mårlind, Michael Ealy, Sandrine Holt, science fantasy, Stephen Rea, Theo James, Underworld, Underworld: Awakening, Urban Fantasy, Vampires. Bookmark the permalink. Leave a comment.